WearTech Tights - WearTech Therapeutics, Inc.
WearTech Tights (patent pending) are made for the purpose of accelerating the healing of cellular function, vessels, muscles and overall soft tissue recovery from training and competition in athletes. The fundamental dynamic, at the heart of WearTech Therapeutics’ products, is continuous, variable DC electrotherapeutic energy that is applied to the legs. This is achieved through two of WearTech Therapeutics’ proprietary product the Sport-Z that generates the DC energy. The result is increased microcirculation to the designated body regions and the beneficial effect is better pain management; reduction of disuse atrophy (muscle wasting); relief of muscle spasticity; reducing edema (swelling); accelerated removal of lactic acid and inflammation which all contributes to improve rapid soft tissue recovery and enhanced endurance. Our highly conductive Electro-Mesh Silver Yarn (EMSY) is the conductive material in the WearTech Tights. They are made into numerous configurations such stockings, gloves and various panels & wraps. EMSY is time tested with proven research and 20 published clinical studies treating greater than 300,000 patients with a sixteen-year safety database. EMSY is in compliance with the FDA/GMP as well as The Medical Device Directive of the EU ISO13485/2003. In addition, EMSY has proven biocompatibility / cytotoxicity laboratory studies. The two main treatment applications are: 1) to wear the WearTech Tights after exercise or post athletic performance for several hours and 2) then while sleeping. WearTech has already developed and clinically proven proprietary copyrighted software for its DC electrotherapeutic energy technology to be delivered thru the WearTech Tights while sleeping. Therapy while sleeping is very effective because: 1) the human body’s biological healing cycle is more regenerative and pronounce at night where 70% of growth hormones are produced along with Venous Endothelia Growth Factor, VEGF 2) pain is often more pronounced at night which is relieved, allowing for better sleeping and 3) the ease of use of getting 8 treatments while asleep. WearTech is the first company worldwide that has researched, innovated, and has proven clinical efficacy of nocturnal therapy while protecting its IP with copyrighted software. There are numerous companies chasing the diagnostic application of wearable textiles, but we will be the first company offering a therapeutics textile to address injury and recovery with WearTech Tights. 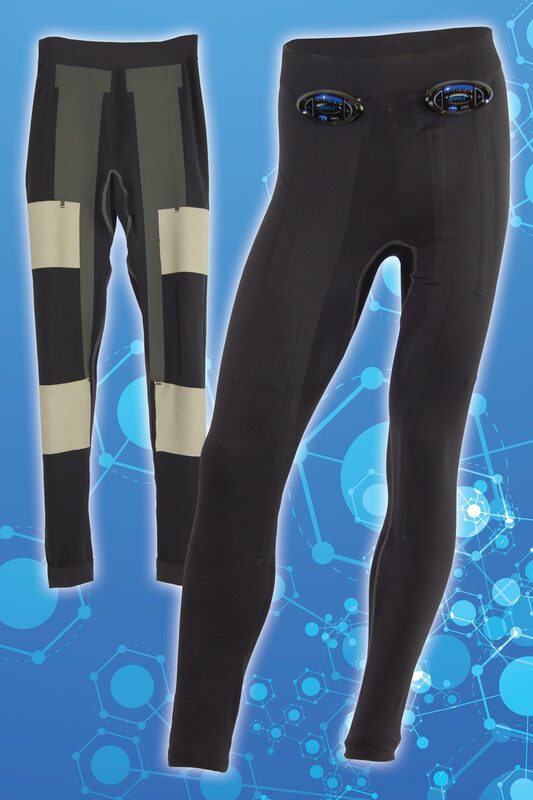 Also, studies were performed by the United States Air Force thru a research grant to WearTech Therapeutics on the function of our WearTech Tights and Shirts. The research proved the function of our tights held up under the strenuous conditions of the Brook Army Centrifuge in San Antonio, Texas. These studies where approved by the IRB of USAF under the direction of the Director Medical of Research of the USAF, ULF Balldin, M.D., Ph.D. The WearTech Tights offer a non-drug therapy that will enhance performance in athletes and should become part of their training and exercise regiments. Electro-therapy of hand held devices (EMS or NMES) has been used for many years in sports for treating injury to muscles as well as muscle conditioning thru gel pad electrodes. The use of these hand held devices are used for muscle injury while producing a contraction or muscle pumping, therefore the adoption of the WearTech Tights as a non-drug treatment should be easily understood and accepted.